Thanks Joel Golliday for the excellent communication and service on my Giulia. We appreciate you being proactive. Overall, very pleased with my car and the service from Alpha Romeo of San Diego. My experience with purchasing a new 2019 Alfa Romeo Giulia was exceptional. Kyle Shanley showed us different cars multiple times and was incredibly patient and courteous each visit. When it came down to purchasing the car, I was concerned that I would need to spend hours there haggling price just like previous experiences I have had at other car dealerships. However to my pleasant surprise my experience was the exact opposite. I came in with my best offer for the car, and Kyle Shanley and Hector Yorba countered with a LOWER offer due to my wife's families military service. Yes, they sold me the car for less than what I offered which is something I haven't encountered before and speaks to the level of customer service offered at this dealership and their respect for the military. 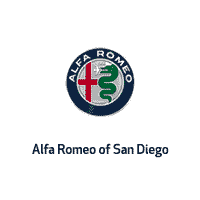 I wouldn't hesitate to recommend Alfa Romeo of San Diego to a friend or family member. Ten stars all the way!!! Sales by Virgil White. Financing by Ray Smith. Both get 5 stars. All the other staff was great too. A very smooth transaction. Having gone through 6 Mercedes, this was a very pleasant change and great buying experience. Got an amazing deal from the Hector at Alfa Romeo. What he promised, he delivered. Great Deal and an amazing car. I definitely would recommend d buying your next car from Hector. Absolutely love this place! My family and I arrived on Sunday afternoon to look at the Stelvio and we ended up purchasing 2! The service was impeccable, we never felt rushed even though they were already closed, Hector Yorba and Ryan Satterfield really took their time with us and made us the best deal possible! Overall the whole experience was so easy and fun! We love our cars and recommend purchasing here 100%!